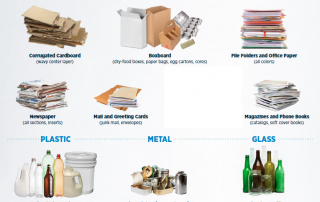 No sorting on your end makes recycling quick and easy! Just focus on tossing all recyclables into one bin and we take care of the rest. Recyclables should be empty and rinsed clean of food residue. Corrugated cardboard boxes should be broken down into 2′ max pieces. Lids and caps under 2″ wide must be removed and thrown in the trash. DO NOT tie newspaper, cardboard or jugs with twine. Handles should be removed from pails and paper bags.